You've never seen a desktop like this before. Because there's never been a desktop like this before. Get full desktop power, fully integrated audio, and sleek modern style with the HP Pavilion Wave. You'll never look at your PC the same way again. Power and performance for a premium entertainment, gaming and multitasking experience. You've never seen a desktop like this before. Because there's never been a desktop like this before. Get full desktop power, fully integrated audio and sleek modern style with the HP Pavilion Wave. You'll never look at your desk the same way again. Don't be fooled by its compact profile. This desktop beauty packs all the power and performance of a standard desktop in a sleek frame. Get the performance of a 6th generation Intel® Core™ processor,1 up to 16GB memory, and optional AMD R9 470M graphics cards. Experience a radical new approach to desktop computing. We re-engineered the traditional tower with efficiency and elegance in mind. With an 85% volume reduction compared to conventional towers, the HP Pavilion Wave is a compact, space-saving marvel. It's small enough to fit nearly anywhere, and powerful enough to handle any task you can give it. The hard drive is located on another side of the triangle, storing important files, photos, music, and programs locally. Inside the triangular design, you’ll find an optimized layout. On one side is the motherboard, with the processor, graphics card, and SSD. The third side of the triangle houses the thermal system, with copper pipes that extract heat and blow it across cooling fins and out the top. Fill the room with incredible sound. 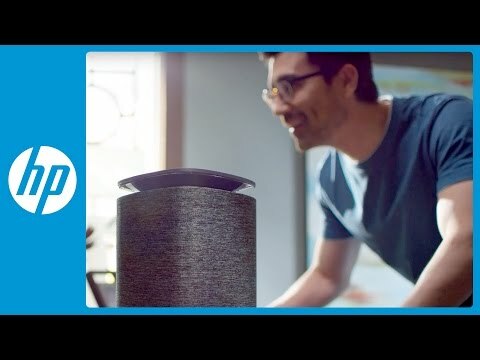 The fully-integrated audio experience from HP’s first tower with a built-in speaker turns your desktop into an entertainment machine, designed to project sound for incredible clarity at any angle. With audio custom tuned in collaboration with the experts at B&O PLAY, experience rich, authentic audio. Let the sound move you. The quality-woven exterior material was carefully created to allow for broad-spectrum audio transmission while retaining the texture and design appeal of fabric. The vented sides at the top of the device allow sound to project out. Meet your new personal assistant. With the built-in microphone, you can talk to Cortana,2 and hear her talk back. Set up reminders, schedule meetings, or search the web in a whole new way – with your voice. We collaborated with Intel's Innovation Excellence Program to optimize voice recognition, perfecting microphone placement and performance, so you can talk with Cortana, video chat, and be heard clearly. Windows 10.3 Do great things. The HP Pavilion Wave with up to 16GB memory keeps up with you. Plenty of port options including 3 USB 3.0, 1 USB 3.1 Type-C, HDMI, and DisplayPort™ to keep you connected. This desktop is not limited to the desk. With its compact size, elegant design, and simple setup, the HP Pavilion Wave gives you the freedom to explore new possibilities. Where will this freedom take you? Your content looks better in high resolution. The HP Pavilion Wave was designed to support one 4K monitor or two QHD monitors, with blazing fast video memory. Add a second monitor for a more immersive and productive computing experience. 1. Multi-core is designed to improve performance of certain software products. Not all customers or software applications will necessarily benefit from use of this technology. Performance and clock frequency will vary depending on application workload and your hardware and software configurations. Intel’s numbering is not a measurement of higher performance. 2. Some features including voice supported Cortana, inking, and Continuum require more advanced hardware. See www.windows.com. Apps sold separately. 3. Not all features are available in all editions or versions of Windows. Systems may require upgraded and/or separately purchased hardware, drivers, software or BIOS update to take full advantage of Windows functionality. Windows 10 is automatically updated, which is always enabled. ISP fees may apply and additional requirements may apply over time for updates. See http://www.microsoft.com. 4. Wireless access point and Internet service required. Availability of public wireless access points limited. The specifications for the 802.11ac WLAN are draft specifications and are not final. If the final specifications differ from the draft specifications, it may affect the ability of the PC to communicate with other 802.11ac WLAN devices. ©2016 Hewlett-Packard Development Company, L.P. The Information contained herein is subject to change without notice. The only warranties for HP products and services are set forth in the express warranty statements accompanying such products and services. Nothing herein should be construed as constituting and additional warranty. HP shall not be liable for technical or editorial errors or omissions contained herein.